Prolotherapy is a Regenerative Injection Technique (RIT) that helps to stimulate repair of damaged or weakened joints, ligaments, and tendons. This non-surgical treatment leads to long-lasting joint strength, increase in joint function, and elimination of pain by stimulating the body’s own cells to replace and repair degenerated tissue. Do you have chronic back joint pain or a sports injury? An old injury that you gave up on? Does your pain get in the way of keeping up with the things that are important to you? Do you want an alternative to surgery? Prolotherapy is very technique-sensitive requiring the practitioner to display exceptional manual dexterity and a skilled ability to locate anatomical landmarks. With almost two decades of hands-on experience in chiropractic training and clinical practice, Dr. Larson has developed the unique ability of technically evaluating the musculoskeletal system. This skillset affords him the ability to perform these regenerative injections with the highest level of safety and effectiveness. 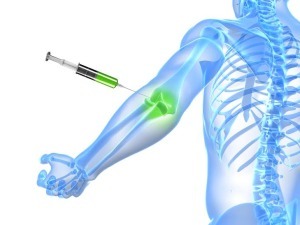 Prolotherapy works by stimulating a healing reaction in the affected area. A specific blend of solutions is injected into the affected ligaments, tendons, or joints, triggering the deposition of new collagen and other building blocks that ligaments and tendons are made of. Pain is relayed to the brain from the tendons and ligaments via the nervous system so when the proper healing takes place, the local nerves are no longer stimulated, and the chronic pain goes away. Whether you’re a competitive athlete, a weekend warrior, or something in between, injuries are imminent. Of course, some injuries are worse than others and your body is designed to handle a great deal of minor injuries and imbalances. However, when an injury causes pain that is beyond ‘good pain’, then you may want to get it assessed so it does not keep getting worse, and so you can get back to your activity as soon as possible. Dr. Larson uses a unique combination of chiropractic, naturopathic medicine, and Prolotherapy to treat the injury at multiple levels. Using this comprehensive approach, we help you reach peak physical performance. Unresolved chronic pain can impact all aspects of your life. Long term use of NSAIDs like ibuprofen or narcotic pain medications or acetaminophen for chronic pain can lead to irreversible damage to the kidneys, liver, or gastrointestinal tract. Very often chronic pain is caused by damage to deep ligaments and tendons that can be successfully treated by Prolotherapy/Regenerative Injection Therapy. * If you would like to more about Prolotherapy or any other of our services, contact us today. Do I get the flu shot?